Christy Gillenwater, Chamber president and CEO outlines the Velocity 2040 process. 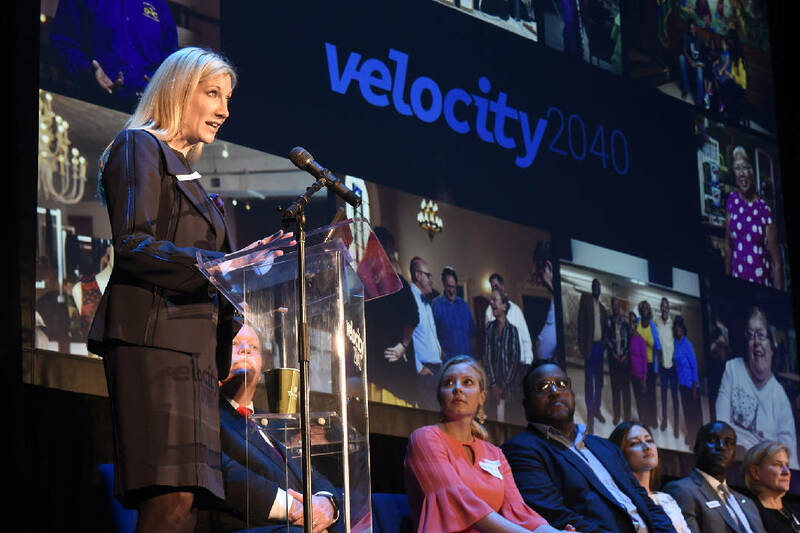 The Chattanooga Chamber of Commerce held a news conference at Memorial Auditorium's Walker Theatre to detail highlights and results of the Velocity 2040 study on Feb. 7, 2019. Velocity 2040 is the new countywide planning process. Whether you're looking for a job, looking for employees to hire or thinking about your children graduating from high school or college in a few years, the Chattanooga Area Chamber of Commerce wants you to take a few minutes to complete an online survey to help prepare its economic development plans for the next five years. The Chamber is finalizing its Chattanooga Climbs strategy for the future this month and is soliciting public input as the plan is put together and a fundraising effort is soon launched for its support. "We invite all Hamilton County and Chattanooga residents to take the seven-minute survey now," said Christy Gillenwater, president & CEO of the Chattanooga Area Chamber of Commerce. "Your voice is important and we need to hear your opinions and thoughts by April 19 about jobs and the talent to fill those jobs for the next five years." The new survey is different from the one in 2018 called Velocity2040 – which is a 20-year look into the future. The latest survey, which is available online at www.chattanoogachamber.com/chattclimbs, focuses specifically on a five-year action plan for economic and talent development for Hamilton County and Chattanooga. 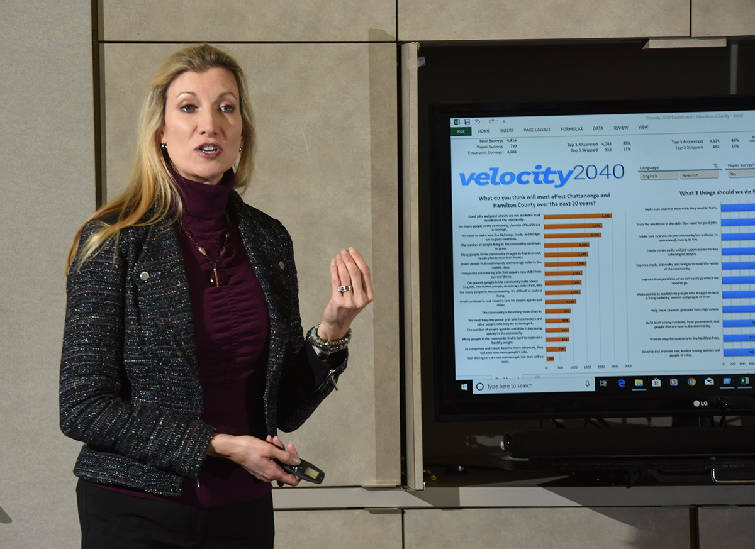 Christy Gillenwater, president and CEO of the Chattanooga Area Chamber of Commerce, presents the Velocity 2040 survey results to the editorial board of the Times Free Press on Friday, Jan 25, 2019. The city of Chattanooga, Hamilton County, EPB and TVA collectively provide more than $1 million a year to the Chattanooga Chamber Foundation to support economic development programs for Hamilton County and the Chamber raises even more private funds and membership dues from private businesses to support its operations. Over the past five years, the Chamber's economic development programs have worked on 88 projects that have collectively brought nearly $3.2 billion of new investment and 10,985 more jobs to Hamilton County, according to Chamber reports. The Chattanooga Climbs initiative will help guide the Chamber's economic and workforce development programs in the next five years. The Chattanooga Chamber Foundation, with funding from private sector investors, hired Avalanche Consulting to help facilitate the development of its five-year strategic plan for economic development and talent initiatives. Avalanche Consulting has completed similar plans for a number of other communities across the country. "You'll see the draft framework for Chattanooga Climbs includes a lot of local stakeholder input - and we need more," Gillenwater said. In developing the workforce for jobs of the future, the Chamber is asking local residents to prioritize how Chattanooga should expand IT and STEM Programs, adult learner programs, work-based learning and aligning schools programs with industry needs, including potential centers of excellence in automation, freight systems and health and wellness. The Chamber is also soliciting input on how it should plan and ready sites for new business and brand the region for marketing to new and expanding businesses. For startups and entrepreneurship, the Chamber is asking for input on training, partnership, capital investments and R&D programs to aid innovation in Chattanooga. To encourage a more diverse leadership in the community, the Chamber also asks respondents about priorities for leadership and civic engagement programs and ways to develop more contacts between businesses, non-profits and elected officials. "We heard what you told us through the Velocity2040 community visioning process and now we're taking next steps as promised with Chattanooga Climbs," said Charles Wood, vice president of economic development for the Chattanooga Chamber.